First, a little story about Anna Faris. My sister was so convinced that Faris was hilarious, she insisted I watch Just Friends just for her small part. She even sat through it with me, just to make sure I watched the whole thing. Does my sister have issues? Clearly. 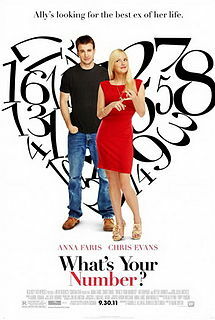 But Anna Faris was really funny as a whack-job starlet in it. Still, I was unconvinced of her ability to carry a movie (not helped by watching The House Bunny). BUT, Anna Faris does carry the movie. I mean, romantic comedies are always a bit light on plot, so it really comes down to the lead actress (take note, Katherine Heigel, Kristen Bell, and whomever else Hollywood keeps pushing as the new "it" girl). I won't spoil anything, but I need to say that I actually laughed out loud during her British accent segment. And the more modern theme of "partner counting" is amusing and relatable to a number of people, I'm sure. I should probably stop reviewing romantic comedies because there isn't really anything new to ever say about them, and that they are usually about what you'd expect. Yes, it's cheesy, and yes, it's predictable. But I liked Anna Faris and having Captain America as co-star doesn't hurt (although on slight glances, he looks a little too much like Freddie Prinze Jr. to me. And he completely lacks an upper lip). Final word: There are worse romantic comedies. At least you won't hate anyone in this one.